Over the last year, the Association for Jewish Studies Board of Directors has been grappling with the challenging topic of membership and conference fees. Our combined membership fees and conference fees do not fully cover the costs of the organization (necessitating various grant writing and fundraising activities). Nevertheless, we recognize that many members and conference participants face significant financial burdens. In a changing academic landscape, the number of adjunct and underemployed individuals in the field continues to rise, and we are concerned about the financial stress placed on individuals without institutional support or research budgets. This concern must be balanced by the Board’s duty to ensure that the Association for Jewish Studies remains a financially sound and stable organization, especially in light of rising costs associated with the annual conference, publications, and other organizational activities. Weighing these realities and in response to member feedback, the Board has decided to institute a number of changes to our membership and conference fees and policies, effective March 1, 2018. 1. 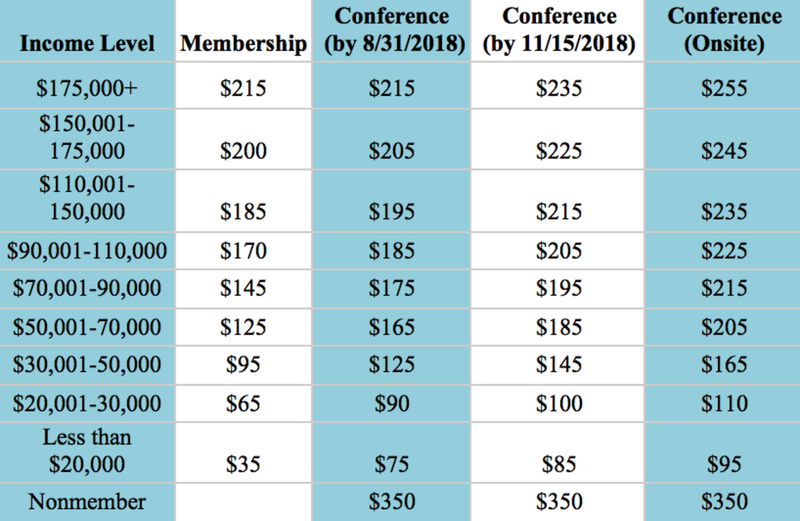 For the first time, we are instituting an income-based conference fee schedule that matches our income tiers for membership fees. What this means is that instead of a flat fee for the conference, those who earn less will pay less to attend the conference than those individuals who earn more. For our members who earn less than $50,000, we are reducing the conference fees. At the same time, some of our upper tiers of membership will be paying more for the conference in order to make this shift financially viable for our organization. This system, like our membership system, is honor-based and while we do not ask for proof of income, we do ask that you please pay your fair share of fees per your income level to ensure the success of this new system. Failure to do so creates financial risk for the organization. 2. Beginning this year, we will no longer require that individuals pay for their conference fees when they submit their conference proposal. While we encourage you to pay at this time by offering an “early bird” rate, you will have until August 31, 2018 to pay your conference fees at the early bird rate. After this deadline, the cost of the conference will increase. If your paper is accepted for the conference, but you have not paid the conference fee by the August 31, 2018 deadline, your name will NOT appear in the conference program and you may be removed from the conference. We are enforcing this policy not only because you cannot participate at the conference without registering, but because we want to eliminate the issue of “no-shows” who not only preclude another member from presenting, but put the organization at increased financial risk. 3. The AJS currently requires that one be a member of the organization in order to submit a proposal to the conference, and membership is not refundable if one’s conference paper is not accepted. Members of the many learned societies who follow this policy understand that membership provides a wide array of benefits beyond the right to submit a proposal to the annual conference. Dues-paying members of the AJS receive: two issues of theAJS Review, the AJS Perspectives magazine, the AJS Newsletters, access to webinars, workshops, job listings, prize competitions, and discounts with select vendors. In addition to these year-long benefits, members’ dues make it possible for the AJS to fulfill its mission of both advocating for and supporting Jewish Studies scholarship with dissertation grants, research grants, prizes, professional development programs, and many other initiatives. We cannot do this vital work that benefits everyone in our community without membership fees. 4. Membership dues have been unchanged for five years. The Board has decided to increase dues generally, while leaving the lowest tier unchanged. 5. We are excited to announce that we will be launching a brand-new membership platform on MyAJS later this month that you will see looks and feels very different from our previous system. We hope you will find this system much easier to use, especially when paying for your membership and conference fees. On behalf of the Board of Directors, we hope you welcome these changes which reflect our continuing efforts to develop policies that address a changing field in a fiscally sound way and encourage the participation of as many individuals as possible, both as members and as conference participants. As always, the Board, the Executive Director, and I welcome your feedback and questions.